L.A. Unified Supt. Michelle King spoke during a town hall meeting at Pacoima Middle School, answering questions about her administration and her vision for the district. March 2, 2016 :: Recently hired school L.A. schools Supt. Michelle King on Tuesday called for traditional public schools and charters—groups often at odds—to work together, pledging to set up a conference where they could share ideas. At a town hall event in Pacoima, before an audience of 700, King demonstrated a growing comfort in her new role as well as skill in framing responses that would appeal to those assembled. Although it was not King’s first public event, the question-and-answer forum at Pacoima Middle School was an early showcase of her direct message to parents. A low-income neighborhood, Pacoima includes some popular charter schools as well as some traditional schools that have struggled for years with low academic achievement. The tension between charters, which are run outside of the district's control, and traditional schools, was underscored over the summer, when the Eli and Edythe Broad Foundation circulated a draft proposal to pull half of district students into charters. Months later, a district-appointed task force concluded that the rapid growth of charters had the potential to drive the district into bankruptcy. Charters are independently managed and exempt from some rules that govern traditional campuses. Most are non-union. King also addressed concerns over state rules that require L.A. Unified to provide available classroom space to charters. From the beginning of her new role as superintendent seven weeks ago, King has said that she will take a collaborative approach to leadership. Tuesday’s crowd was a mixture of parents from charters and traditional schools. About half the parents asked their questions in Spanish. Several were challenging. And King could not make everyone happy. A man asserted that the district never fired teachers, but instead sent them to schools in low-income communities. “We don’t want to fire folks, period,” King said. The preferred process, she said, is to provide educators with assistance and guidance. When that fails, “we do take teachers and other employees to the Board of Education and they are dismissed.” This happens, she added, at every board meeting. Several parents said they liked King’s message about collaboration. “That she’s hearing us out speaks to her character,” said Gwendolyn Posey, whose daughter attends a nearby charter run by Fenton Charter Public Schools. 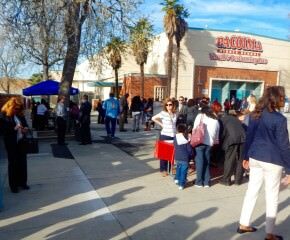 “She’s hearing us out and taking the time to do that,” said Elisa Venzor, a parent at Pacoima Charter Elementary. She adopted a wait-and-see position regarding charter cooperation. “It sounds good -- if they can make this happen,” she said. The superintendent also noted that her top short-term priority is getting as many students as possible to graduate from the class of 2016. The district appears on track for a record graduation rate, but observers have questioned the rigor of make-up classes. King said that events like the Pacoima forum are important because the district’s strategic plan should not be hers alone but should result from input across the nation’s second-largest school system. It’s still not clear how King will respond when voices answer back in cacophony or in conflict. L.A. teachers union President Alex Caputo-Pearl on Tuesday said that teachers in all types of schools are already collaborating in some areas. But his union has protested against locating charters at traditional schools. The state charter schools association, meanwhile, is suing the district, saying that charters aren't receiving their fair share of either space at existing schools or money to build new ones. As far as academic collaboration, charter leaders look forward to setting up events that could draw in all kinds of schools, according to the association. But it added that the district has, so far, made no concrete moves in that direction. Editor's note: Education Matters receives funding from a number of foundations, including one or more mentioned in this article. The California Community Foundation and United Way of Greater Los Angeles administer grants from the Baxter Family Foundation, the Broad Foundation, the California Endowment and the Wasserman Foundation. Under terms of the grants, The Times retains complete control over editorial content. 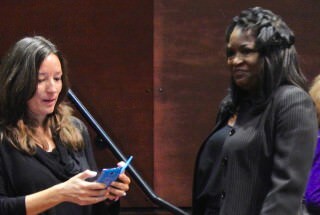 Monica Ratliff prepares to take a selfie with Michelle King at the town hall. 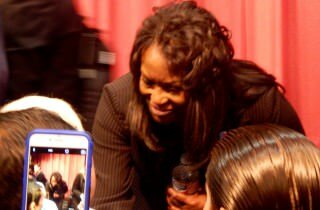 March 2, 2016 10:10 am :: At her first community town hall as LA Unified’s superintendent, Michelle King received the most applause when she called for a healing between charter and district school factions. Seven weeks into her job, she met Tuesday morning with more than 700 parents, teachers, principals and local residents in a relatively low-income area in the north San Fernando Valley where many of those in attendance had strong feelings about charter schools. The Pacoima Singers perform before the question-and-answer session. She told the audience how she became a teacher and discussed a diverse range of topics that came from parent questions including students cutting themselves, school calendars, teacher firings and campus bullying. The town hall was so successful that officials hope to replicate it in other parts of the district and hold them regularly. Although she has met with civic groups, teachers, principals and other specific groups so far since she was named in January, this was King’s first meeting that encouraged all community members to attend. King was treated like a rock star. 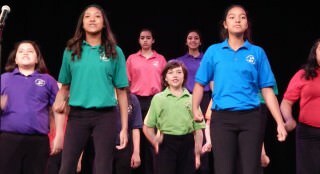 The audience almost exceeded the capacity of the performing arts auditorium at Pacoima Middle School, with many standing in the back. People greeted her and hugged her, some took selfies with her, a half dozen media outlets came to cover the event, and she received a standing ovation at least twice. Babies were crying in the audience and audio translations were available in Armenian and Spanish. Flyers and posters were in English, Armenian and Spanish. And so she did, and it may well become a model for more town halls for the superintendent, and a way to respond to parents directly with their issues. Both King and Ratliff were delighted with the response and turnout for the two-and-a-half-hour question-answer session, which began with informal schmoozing outside where community members were served apples, bananas, coffeecake, coffee and water with cucumbers. District Northeast Superintendent Byron Maltez, District Northwest Superintendent Vivian Ekchian and many staff members from various LA Unified departments were in attendance in case parents had specific concerns about certain schools. Attendees were handed informational brochures and given sheets to write down questions which would get answered by email or telephone if they weren’t answered at the meeting. Ratliff said the answers would also be posted on her LAUSD website. The charter school issue that has been so divisive in the community seemed to be on a lot of people’s minds. One Spanish-speaking parent was concerned that charter schools did not follow certain laws and were not properly monitored, to which King explained how the district monitors all independent and affiliated charter schools and offers recommendations and guidance if there are violations or complaints. Great Public Schools Now, an Eli Broad-affiliated nonprofit focused on accelerating the growth of high-quality LA public schools including charters, emailed a statement after King’s remarks. The group’s plan was denounced in a unanimous vote in January by the LA Unified school board one day after King was named superintendent. The morning started off with the middle school cadets marching in with the U.S. and California flags and reciting the Pledge of Allegiance. 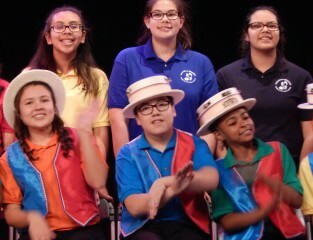 Then the Pacoima Singers from the Television, Theatre and Performing Arts Magnet on campus performed a few timely numbers, especially one dealing with a faux election, as it was Super Tuesday. Among the issues that came up was from a distressed father who said his daughter was wearing long sleeves to hide the fact that she was cutting herself, and he then discovered her friends were doing the same. A mother from Colfax Charter Elementary School complained that other districts start school after Labor Day and wondered why the district spends $1.4 million in taxpayer money to run air conditioners in order to hold classes in August. King laid some of the blame on the Board of Education supervisors because her office suggested a three-year calendar, but they only approved it for one year and are looking into the issue. King said the district had a study for nearly nine months asking for input and said in her more than three decades at LA Unified, “I never saw such an action where so much input was sought trying to get information to make a decision.” She said the biggest issues about the schedule are starting school before Labor Day, having a week off for Thanksgiving and having three weeks off over winter break, as the district now has. Breakfast was served during the town hall. “We decided to take more time and more examination and gather more input to come up with a different recommendation,” King said. One mother said through a Spanish translator that her 11-year-old son was shot and killed on his way to school and that she was concerned about the proliferation of marijuana dispensaries in the area. King said, “I’m sorry for your loss, and let me say that our first priority is the safety of your children at all our schools.” She said that includes bullying and cyber-bulling. King discussed the issues she is working on, including the budget situation, how to bring arts and music to all schools in the district, getting more parents involved in schools, and bringing back summer school not just for remediation but for students who are interested in getting ahead and becoming more prepared for college. Michelle King was treated like a rock star. One of the community members, North Hills West Neighborhood Council member Garry Fordyce, suggested to King that she coordinate more with the councils, which are advisory groups for the Los Angeles City Council. King said she hoped to reach out to stakeholders like the neighborhood councils more and include them in a community strategic plan. At the end of the meeting, Ratliff said, “I’d be happy to do this all day if we could.” She said she felt the questions and reactions from the audience were very positive. “They were clearly being honest about what is going on in our schools, and I appreciated that,” Ratliff said after the meeting. Appointed to the school district’s top job less than two months ago, King made her first public visit to the San Fernando Valley as superintendent in an event she said was part of an ongoing, districtwide listening tour. She said she wants local parents to hear her vision for the nation’s second-largest school system and to answer questions about her priorities. She said those priorities include increasing graduation rates and literacy among elementary school children, bringing back arts and music programs, expanding summer school, creating fiscal stability for the district — and, more importantly, uniting a district that she said seemed splintered under the strain of charter school expansion, magnet school interest and public school budget strains. King, 54, is the first African-American woman to hold the superintendent’s post and the first woman in more than 80 years to lead the district. She told the crowd she was a product of LAUSD and had wanted to become a doctor but, in her senior year at UCLA, saw an opportunity to use her biology degree as a teacher for the district. King taught for 31 years as a science and math teacher, beginning at Porter Middle School in Granada Hills. She was tapped by Superintendent Ramon C. Cortines as chief deputy when he returned to the district in October 2014. Fielding questions posed in English and Spanish, King said she would like to see more unity from district staff and parents on how to improve special education. Several parents, including Marta Martinez and Juana Gomez, both of whom have 9-year-old children with special needs, said their kids are not receiving the kind of instruction that is helpful. Both mothers said they were grateful that King was willing to hear parents out. Tuesday’s town hall was the first time they had a chance to see her speak, they said. Mamie Nelson, who runs a group home for at-risk children, said she wanted to know if charter schools were starting to benefit under California’s Proposition 39, the voter-approved measure that allows independent charters to have access to public school facilities. Nelson said she asked the question because she thought the money was not being distributed equally and public classrooms are still overcrowded. The district and the California Charter Schools Association have been at odds for years over how to implement the measure. Augustina Garcia, a mother of an 11-year-old attending Pacoima Middle School, asked King about campus safety and the efforts to keep children away from violence and drugs. She said her eldest son, Ramon Garcia, was gunned down while leaving San Fernando High School in 2013. 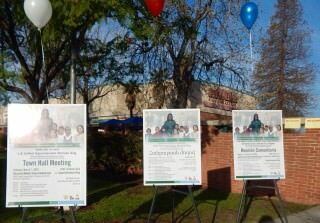 The hourlong town hall-style event was hosted and led by LAUSD board member Monica Ratliff of District 6, in the northeast San Fernando Valley. Local superintendents Vivian Ekchian and Byron Maltez also attended to take information from parents who had questions. King said she believed the event went well and hoped parents would continue to attend more so she could understand their concerns. I am getting comments from cranky Bloggerati that worry that the superintendent may have already "cut a deal". I'll feel better about all this when I see Sarah Angel of the CCSA wearing one of those "We ♥ LAUSD" buttons - and meaning it ...but not for dinner! And when the Billionaire Boys Club doesn't amass millions to run against LAUSD incumbents. If it's not about the money how come it's worth so much money?